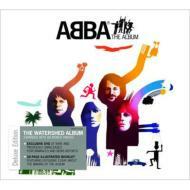 My last comment on 05june2007 was for ’ABBA - The Album Deluxe version with DVD on TV and commercials specials’ NOT for this reissued SHM-CD series. This SHM-CD series is just average. That is, the front cover print is good BUT sound qulaity isnt as good as the 2005 ’The Complete Studio Recordings Box-Set’.. in my opinion. This is a Japan (International Import) version. It’s good to be able to watch some of these previously unreleased materials again.